VSA® helps to stabilize the vehicle during cornering if the vehicle turns more or less than what was intended. It also assists in maintaining traction on slippery surfaces. It does so by regulating engine output and selectively applying the brakes. The VSA® may not function properly if tire type and size are mixed. Make sure to use the same size and type of tire, and the air pressures as specified. 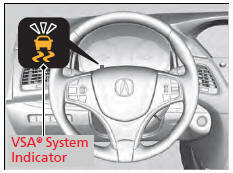 When the VSA® system indicator comes on and stays on while driving, there may be a problem with the system. While this may not interfere with normal driving, have your vehicle checked by a dealer immediately. VSA® cannot enhance stability in all driving situations and does not control the entire braking system. You still need to drive and corner at speeds appropriate for the conditions and always leave a sufficient margin of safety. The main function of the VSA® system is generally known as Electronic Stability Control (ESC). The system also includes a traction control function. 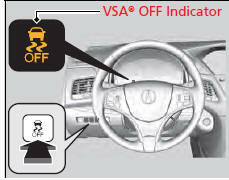 When VSA® activates, you may notice that the engine does not respond to the accelerator. You may also notice some noise from the hydraulic system. You will also see the indicator blink. This button is on the driver’s side control panel. To turn the VSA® system on and off, press and hold it until you hear a beep.